We have had some serious winds (and I am not talking about the vegi diet here). 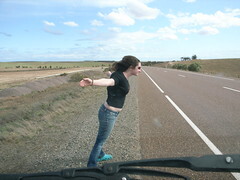 This was on the road to Port Lincoln. The steering wheel was constantly pulled over to the right.